Apprentice Diaries, 3: Eyebrows, eyebrows, eyebrows. I’ve always been a three-product girl when it came to make-up. I have my foundation, my mascara and my turquoise eyeliner. (A color that I’ve been wearing religiously for the past seven years. So much so, that it has become somewhat of a superstitious act if I don’t wear it.) Regardless of whether I wake up with fifteen minutes to spare before I have to leave my house, or an hour, I know the one thing I can rely on is the efficiency of my make-up routine. And on days when even putting on two of my three-product routine seems like too much, I at least wear mascara. It is my go-to product. It makes the biggest pop, accentuates my features and only takes thirty-seven seconds to apply. Now that I have begun my Cosmetology apprenticeship though, and moved through initial practicals, including make-up application, my focus has shifted a little. I draw my eyebrows in. Forget about mascara, if I have to choose, I won’t leave the house without drawing them in. The difference it makes when I do, is H-U-G-E. They frame my face and when I draw them in, it fills in any holes where my brow hair might be thinner. Drawing them on and filling them in evens out my brows, and creates a nice clean structure. When they’re drawn in, I feel unstoppable. I feel strong, and well put together. I’m sure to some degree, it might seem impossible that drawn in brows can make such a difference; on my face and in my personality. But they do. That’s what really great about make-up and finding the right tools and products for you. 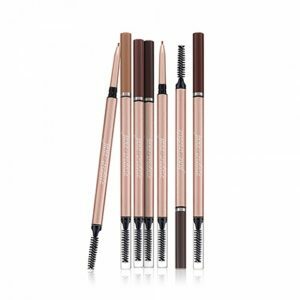 Recently, in 2016, Jane Iredale launched a new Retractable Brow Pencil. Joining the fleet of brow products in Iredale’s line (think: PureBrow Gel, Great Shape Eyebrow Kit, and Bitty Brow Kit), this new pencil has a fine point tip, with medium coverage so the result is still realistic, without making my brows look too heavily drawn on; resembling felt cut-outs. It’s long-wearing, water-proof, and doesn’t smudge easily. When drawing my brows in, I start at my arch to ensure I begin my heaviest handed strokes in the center of my brow. From there, I fan out my strokes toward the tail of my eyebrow. I then outline my brow head to create nice clean lines, ensuring that my brow hairs stay within the “box” I’ve drawn for them. With light strokes, I make short brushes from bottom to top, to the degree of coverage I am looking for. Sometimes, I am looking for a softer brow. I merely want to create a shadow behind my natural brow. Other times I want something stronger; something bolder, and increase the degree into which I shade my brows. I can achieve both with the Retractable Brow Pencil. The other side of this whole equation, is ensuring that the base – my natural eyebrows – I am working with are in their best shape possible. Which is why I wax them. A professional wax gives my eyebrows that extra edge. It makes sure that the hairs aren’t scraggly, they are even and that no hairs go “rogue.” This is something that can’t be achieved in my home bathroom. I need the touch of a professional, to assess my face shape, the angles that my face creates and how my eyebrows best fit into that geometric pattern. So now my make-up routine includes a fifteen minute wax every few weeks and a minute and a half session of drawing my eyebrows in every day. And they’re totally worth my time! 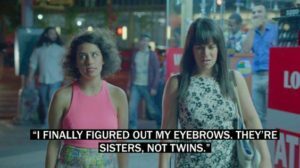 Admit it, now you want to see what your best eyebrows look like! Book a brow wax and a complimentary mini make-up session to learn how to best draw your eyebrows in with the different tools Jane Iredale provides. PreviousPrevious post:February 2017 – NewsletterNextNext post:March and The Apprentice at Debony Salon!